My eight week summer residence at the Kennan Institute is flying by so fast. I am about halfway done with my fellowship and it has been a busy summer thus far. In addition to doing my own research and writing my book manuscript, I am working with a research assistant who is helping me with data collection, and I attend lots and lots of events! After living in Atlanta for two years where East European events were few and far between (I even started a lecture series at Clayton State because there were so few events on my region) it has been nice to have so many different types of events to choose from. Every week there is at least one event of interest to me if not more! The funny thing is people say that the summer is the light time of year for events but I have even had to start picking and choosing what to go to in order to balance my writing time with events. Here are some of the events I have attended at Kennan Institute at the Wilson Center. 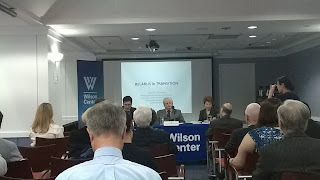 The first talk I attended on my first day at the Kennan Institute was entitled "Belarus in Transition"
with Larissa G. Titarenko Professor, Belarus State University; Former Fellow, Wilson Center and Valery Yevarouski Fulbright Research Scholar, Kennan Institute; Head, The Centre for the Historiophilosophical and Comparative Researches, Institute of Philosophy of the National Academy of Belarus. Most of the talk focused more on the historical angle of the Belarus rather than possibilities for a transition to democracy. But Titarenko also spoke of the role that Belarus has played as a mediator in the negotiations in the Minsk protocol between Ukraine and Russia and provided a space for multilateral negotiations. 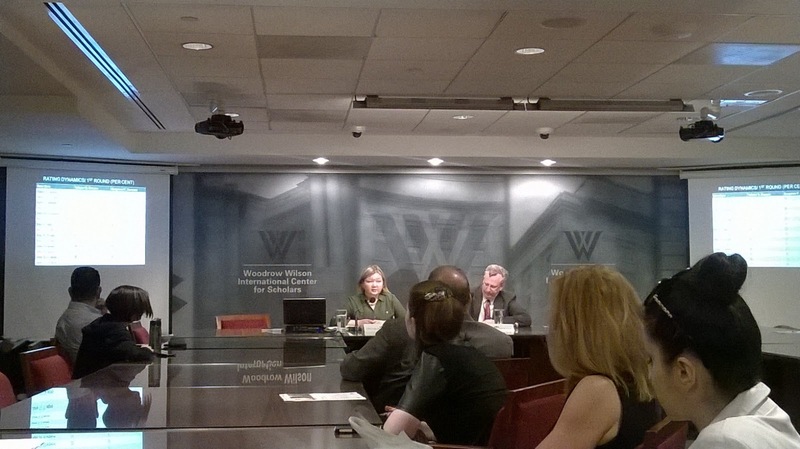 Also she reminded us that Belarus has not recognized Russian annexation of Crimea an important caveat to remember. We don't hear about Belarus that often other than news of Lukashenko's dictatorship so it was refreshing to hear about perspectives from the country concerning things more than just regime type. 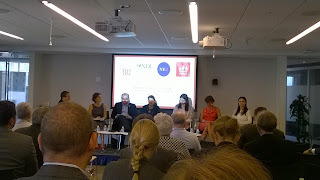 Next, I attended a talk on "The Role of Media in Russian Democracy" by Nataliya Rostova a George F. Kennan Expert and well known journalist in the region. This talked looked at media coverage during the Yeltsin years and the beginning of the slow decline to authoritarianism and media censorship. The room was packed and it was surprising to see how many people wanted to talk about democracy or the lack thereof in Russia today. 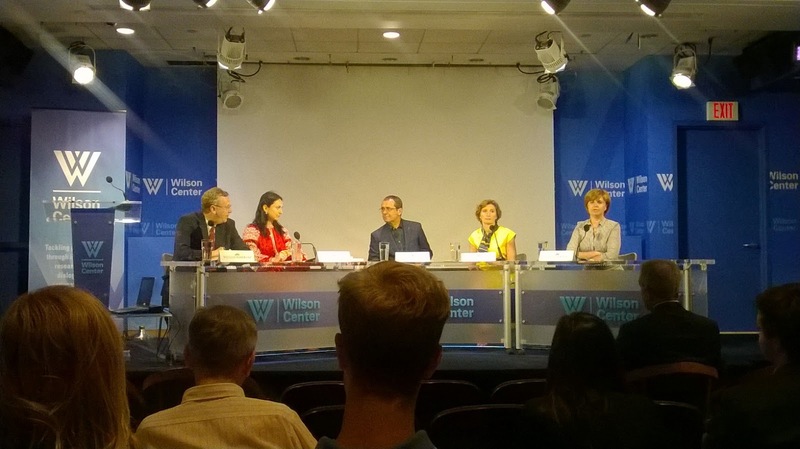 Many people had questions looking for linkages between Yeltsin and the current regime under Putin. 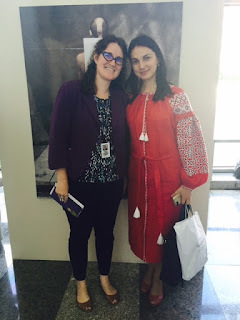 Ukraine has been a popular these the past few of weeks at the Kennan Institute and it all began with the talk "Engaging the Arts for a Vibrant, International Ukraine" which I thought was going to be about art but instead focused on cultural and educational exchanges or cultural diplomacy. The speakers Kateryna Smagliy, Director, Kennan Institute in Ukraine, Victor Sydorenko Artist; Director, Modern Art Research Institute, National Academy of Arts of Ukraine, Olha Ivanova, Counselor on Cultural Issues, Embassy of Ukraine to the US, and Hanna Hopko, member of parliament and head of the Foreign Affairs Committee, Verkhovna Rada of Ukraine discussed how to develop Ukraine's "soft power" in light of existing economic constraints and informational challenges within the country. The talk focused on the situation in Ukraine and promoting national interests and connections with the United States. 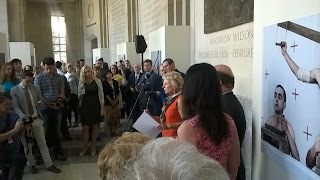 After that talk Sydorenko's art exhibit "Memory of Unconsciousness"opened in the atrium of the Wilson Center and Ambassador Valeriy Chaly, Ambassador Extraordinary and Plenipotentiary of Ukraine to the USA opened up the exhibition with a few words about the strong relationship between Ukraine and the United States. Me and Hanna Hopko, member of parliament and head of the Foreign Affairs Committee, Verkhovna Rada of Ukraine who is also a member of the Equal Opportunities Women's Caucus I have been writing about lately in parliament for a paper on municipal level gender quotas. I spoke with her about it and she said that they need quotas on the national level in the Rada next! I could not agree more! Finally, there was an event cosponsored by the National Democratic Institute, the National Endowment for Democracy, the International Republican Institute, and the Kennan Institute entitled "Making Democracy Work: The Politics of Reform in Ukraine." Here Hanna Hopko was joined by two other MPs from the Rada Natalya Katser-Buchkovska and Ostap Yednak. They all spoke about the significant list of reforms that they were working on in Ukraine and the barriers faced by reformers in Ukraine.